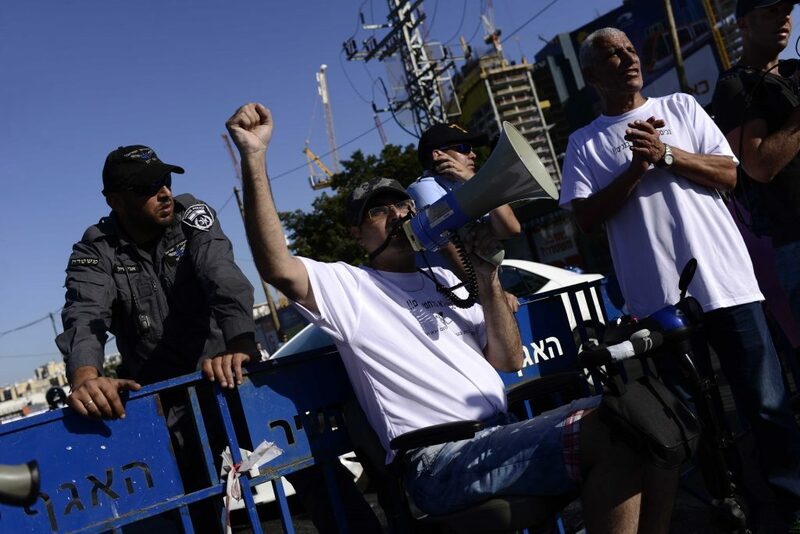 In a campaign to raise benefits for the disabled to the level of the minimum wage, about 200 disabled people demonstrated on Tuesday evening in Tel Aviv, where they blocked the exit to the Ayalon Highway from Arlozorov Street. After Prime Minister Binyamin Netanyahu rejected the recommendation of the Zelekha Committee to increase disability allowances to 4,000 shekels per month in several stages, he appointed a replacement committee to formulate a new plan. The Committee for the Examination of Disability Allowances, headed by Prof. Avi Simhon, is expected to recommend increasing the allowances by hundreds of shekels only, much less than the Zelekha Committee suggested. In addition, eligibility for the expanded amount would be restricted to those defined as at least 75 percent disabled and below the poverty line, according to Ynet. The heads of the disabled organizations are pressing the demand for increase of disability allowances to the level of the minimum wage: NIS 5,000.